In Miyazaki Prefecture in Kyushu, Japan, there is a town called Kunitomi. In this small and peaceful rural place, my 86 year old grandmother and my 23 year old cousin Daiki were living together. My grandmother raised Daiki since he was a child. They were living in the same house, eating and sleeping in the same room together. Every time I visited her, there was always Daiki beside her, and she would always talk about him. True to his word, Daiki remained by her side, continued to live with her and fully devoting himself to her care. For Daiki, she must have been the place where he truly belonged. Daiki was the treasure for my grandmother in her later life. They needed each other, and cared for one another. 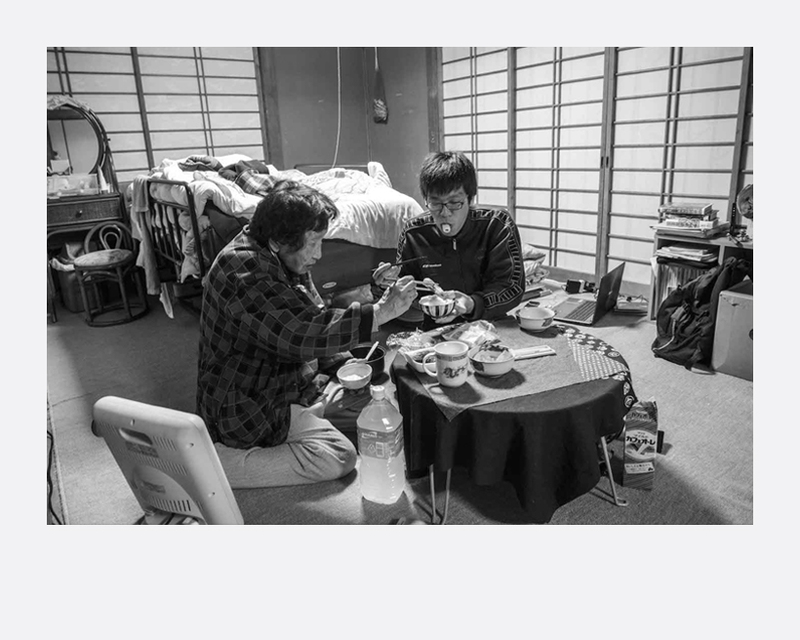 I had observed their everyday life and began photographing them, as a family member and also as a photographer. This was supposed to come to an end with my grandmother’s death, which I was expecting in the not-so distant future, but one day the end came unexpectedly. Daiki suddenly went missing. Almost a year has gone by without any clue of his whereabouts. Then one day, Daiki’s body was found in the forest. He ended his life as if fresh green young leaves eventually turn to brown as seasons change, and fall to the ground after having fully accomplished its life. The following year my grandmother passed away. What remained behind were countless photographs of their life together. Through those photographs, I try to reach out to them, try to engage in a dialogue with them once again. This is the love story of their life together. Born in Miyazaki, Japan, Akihito Yoshida earned a degree in Special Education from Shiga University. For a year he taught Japanese at a university in Thailand and upon returning, at a primary school in Kyoto for six years. In 2010, he began a career as a documentary photographer, publishing three photo books, Brick Yard (2014), Tannery (2015) and The Absence of Two (2017). He was shortlisted for the 2015 Paris Photo- Aperture Foundation Photo Book Award for the book, Brick Yard, and won the Grand Prize in the People’s category of 2015 Nikkei National Geographic Photography Award.